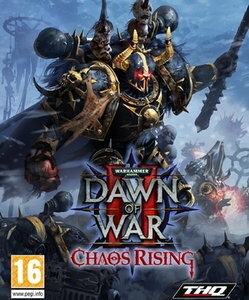 Warhammer 40,000: Dawn of War II – Chaos Rising is a real-time strategy video game developed by Relic Entertainment and published by THQ, and the sequel expansion of Warhammer 40,000: Dawn of War II. The game was released on March 11, 2010 for Games for Windows. Chaos Space Marines are introduced in the game and all the races in the previous game (Space Marines, Eldar, Orks, and Tyranids) were given new units. The game predominantly takes place on the ice-covered home-world of the Blood Ravens, Aurelia. Gabriel Angelos explains Aurelia was lost to the Warp for a thousand years, but has now reappeared along with an active Blood Ravens' beacon. Chaos Rising is set one year after the events of Dawn of War II and the defeat of the Tyranid invasion (as well as the Eldar and Ork forces) of sub-sector Aurelia. The campaign marks the return of the Blood Raven heroes from the previous game, the Chaos Lord Eliphas from Dark Crusade, Derosa as the new governor of Meridian, and the heretical Vandis. New to Dawn of War II: Chaos Rising is the Corruption System. 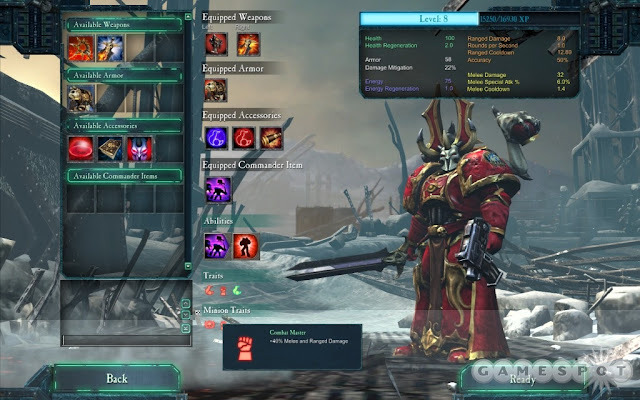 In the campaign there are often multiple objectives which will complete a mission; depending on which one a player chooses to complete, they will become more or less corrupted. Corruption describes how close the player's Marines (ie: the Force Commander, Jonah and the rest of the Squads under the player's command except for Davian Thule, who is the only member unaffected by corruption) are to turning to Chaos and betraying the Imperium of man. This is a conscious choice in the gameplay and will affect the ending of the game as well as what missions are available throughout the campaign for the player.